← q&r: genesis and evolution? But the peculiar thing, at least from a biblical perspective, is that the rich – the ones with the abundance – rely on an ideology of scarcity, while the poor – the ones suffering from scarcity – rely on an ideology of abundance. How can that be? The issue involves whether there is enough to go around – enough food, water, shelter, space. An ideology of scarcity says no, there’s not enough, so hold onto what you have. In fact, don’t just hold onto it, hoard it. Put aside more than you need, so that if you do need it, it will be there, even if others must do without. An affirmation of abundance says just the opposite: Appearances notwithstanding, there is enough to go around, so long as each of us takes only what we need. In fact, if we are willing to have but not hoard, there will even be more than enough left over. The Bible is about abundance. From the first chapters of Genesis, God not only initiates abundance – calling forth plants and fish and birds and animals – but promises continued abundance by commanding them to “increase and multiply” (1:22). God’s generosity and fidelity reach their climax on the sixth day, when God proclaims a sufficiency for “everything that has the breath of life” and declares all this “very good” (1:30-31). Having thus set in motion a world of abundance, God rests – the mechanisms are in place, the world will have enough. God hears their cry, and sends Moses to tell Pharaoh that the God of abundance has come to free the Israelites from this ideology of scarcity. And Yahweh won’t accept no for an answer. It takes convincing, but Pharoah finally agrees – at least long enough for the Israelites to gather their belongings and put a river between themselves and Egypt. It isn’t long before what they have left behind starts to look good compared to what they must face. They left the land of scarcity thinking they would bounce into the land of abundance. Instead, they find themselves at risk in a wilderness, a desert with no visible life-support systems, a place of scarcity where even bread seems an impossibility. Having inhaled the continuing reality of scarcity throughout their lives, the Israelites breathe out murmurs, complaints, condemnations, and reveries of Egypt – where at least there was bread. Then, in this desert wilderness, bread inexplicably appears. A fine, flaky substance comes down, answering Israel’s risk with a manifestation of God’s faithful generosity. This bread violates all their categories: It overturns their conviction about scarcity and cancels their anxiety about hunger. The gift of bread transforms the wilderness. And from that point on, Israel would entertain the thought that a place of perceived scarcity may turn out to be a place of wondrous abundance. In the New Testament, Jesus knows all about the generosity and fidelity of God. In his very person, the whole of Israel’s faith is expressed with a new intensity. Filled with God’s generosity, Jesus went around to people suffering from scarcity – of health, of acceptance, of power, of understanding – and replaced it with a gift of abundance. The eighth chapter of Mark’s Gospel contains the second feeding narrative, a story rich in Israel’s past. Jesus notices that the people who’ve been listening to him have run out of food. He’s been here before, back in chapter six where he fed the five thousand. But hunger – scarcity – isn’t a one-time experience, and Jesus isn’t in the “symbolic gesture” business. He’s in the generosity business, and that means being constantly alert to any mismatch between the generosity of God and the needs of the people. In this instance, the mismatch moves Jesus “to compassion” – a Greek term that means that his insides are turned over. Jesus has this strange bodily sense of an emergency. He cares about the hungry and knows something must be done. At first Jesus doesn’t say anything about how the people’s hunger might be satisfied. He just points out the need: “they have nothing to eat” (8:2). Perhaps he’s hoping his disciples will remember the last time this happened, and start looking around for a few loaves and fishes. But their minds are still stuck on scarcity: “How can you feed these people with bread in the desert?” (8:4). You can sense the resistance in the disciples’ question. It’s the resistance of pragmatism, of efficiency, of “the real world.” The words are “how can you?” but they’re really saying “You can’t.” “It won’t work.” “Get real.” These are not generous words; these are not words that arise from abundance. But Jesus has abundance on his mind, so he doesn’t even answer their question. Instead he moves on, asking a question of his own: “How many loaves do you have?” (8:5). They answer: “Seven.” It’s enough. He tells the crowd to sit down. The Gospel of Mark doesn’t usually go out of its way to make the disciples look good, but it’s not above giving them a few good lines on occasion. In verse four it is the disciples who raise the question of finding “bread in the desert” – an echo of Exodus. And in verse five they affirm that there are seven loaves – evoking the number of days God spent creating the world. The message from Mark seems clear: Jesus brings to this concrete moment a rich background from the community of Israel. Part of that background, I believe, Jesus picked up at home, where he heard his mother Mary sing her Magnificat that includes the words “he has filled the hungry with good things” (Luke 1:53). And the Magnificat, it appears, borrows from 1 Samuel 2, where Hannah, the mother of Samuel, sang that “those who were full have hired themselves out for bread, but those who were hungry are fat with spoil” (1 Sam. 2:5). So Jesus remembered the songs of mother Mary and mother Hannah – songs of God’s generosity toward those in need. Jesus is well-schooled in the transformative generosity of God. He is also well-schooled in the conviction that if you share your bread with the neighbor, the world will be made new. He knows that generosity isn’t something you just think about, it’s something you do. Mark uses four words to describe what Jesus did: took, gave thanks, broke, and gave. The words are familiar; they are Eucharist words. Out in the desert, Jesus uses seven loaves to conduct a sit-down thanksgiving dinner that matches the needs of the people with the generosity of God. And his actions are transformative. 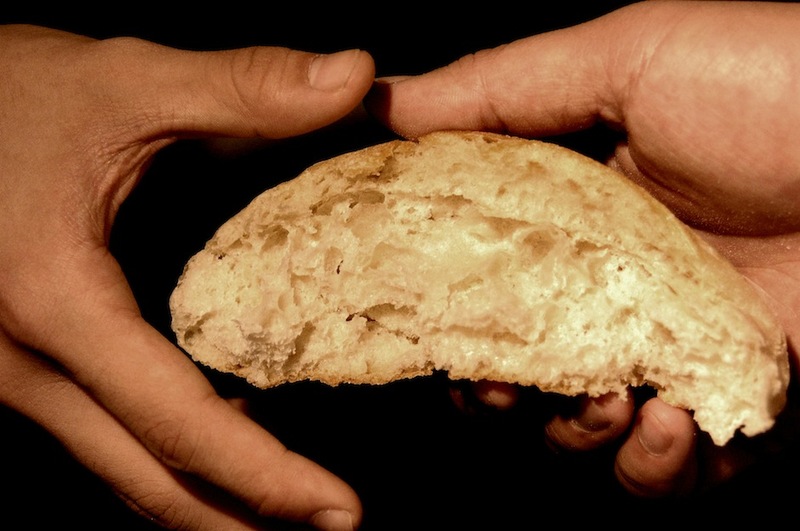 The bread stays exactly what it is – bread – yet it becomes something it never was before: a carrier of all the hidden, powerful gifts of God. The crowd stays as it is, but it becomes something it never thought it would be: a people entitled to what they can’t provide for themselves. The desert stays as it is, but it becomes something that no one would ever expect: a viable place of existence, the arena for the reign of God. Jesus has put into practice the generosity of the Creator. It is as though Genesis 1 reappears in Mark 8, and the world is again made new. Gifts, when they are blessed and broken and given, have immense potential. How could anyone take seven loaves (plus a few fish) and feed four thousand? But the narrator says that all ate and were full. And Hannah said, “those who were hungry are fat with spoil.” And Mary said, “he has filled the hungry with good things.” Signs of unlimited generosity are abundant and visible, leaving no room for the mistaken notion of scarcity. We don’t experience the world that way. But Mark’s Gospel suggests that this is because we, like the disciples, are not clear about the limitless generosity of God. The disciples were not convinced that seven loaves were more than enough to feed four thousand. Chances are, they were worried that if they started distributing the bread, there wouldn’t be enough to go around. They did not grasp generosity and gratitude and abundance. We see this later in the same chapter, when the disciples are out in a boat with Jesus. Mark tells us that they “had forgotten to bring any bread” (8:14). They no longer remembered one critical truth: that Jesus is in the generosity business. Jesus notices this and says, “Watch out – beware of the yeast of the Pharisees and the yeast of Herod” (8:15). The Pharisees are the parsimonious ones who want to ration everything. The Herodians are like Pharaoh, they want to monopolize everything and store it up and administer it. And Jesus is warning them: Watch out for their junk food. If you eat it long enough, you will think and act the way they do. Apparently this puzzles the disciples; they keep murmuring about the bread they forgot. Jesus hears their whispering, and he blasts them with rapid-fire questions that are really accusations. “Why are you talking about having no bread? Do you still not perceive or understand? Are your hearts hardened?” (8:17-18). Have you forgotten, Jesus seems to ask, that abundance has vetoed scarcity? Or are you still back with Pharaoh, who never thought he had enough and wound up with a hardened heart? The questioning continues: “When I fed five thousand with just five loaves, how many were left over?” They answer: “Twelve!” “When I fed four thousand with seven loaves, how many were left over?” “Seven!” The disciples are really good at concrete, operational, statistical stuff, but they cannot negotiate from the line items to the big picture. So Jesus ends up asking – in one of the most pathos-filled lines of all scripture – ”Do you not yet understand?” (8:21). There is no answer. Stuck in the anxiety of the moment, they’ve already lost sight of the message from the past. One glaring example of today’s anxiety-driven scarcity is the frenetic activity that so characterizes our society. Corporate executives boast a “24/7″ mentality as a bulwark against losing their edge or missing an opportunity. Those of us with less “prestigious” positions continually wrestle with our bulging appointment books and ever-growing to-do lists. Even youngsters have exchanged a carefree childhood for a schedule of structured activities. There’s never enough time; there’s never a moment’s rest. The Bible offers an antidote to all this activity: the call to Sabbath. As shown in the creation account, Sabbath (God’s day of rest) is based on abundance. But how willing are we to practice Sabbath? A Sabbath spent catching up on chores we were too busy to do during the week is hardly a testimony to abundance. A Sabbath spent encouraging those who want to fill our “free time” with calls to amass more possessions – whether the malls with their weekend specials or televised sports events with their clutter of commercials – does nothing to weaken the domain of scarcity. Honoring the Sabbath is a form of witness. It tells the world that “there is enough.” Too often, the church has understood God’s unconditional grace as solely a theological phenomenon, instead of recognizing that it has to do with the reordering of the economy of the world. We cannot separate the two. When Jesus was asked which was the greatest commandment, he replied with a trick answer: “You shall love the Lord you God with all your heart and soul and mind and strength” and “you shall love your neighbor as yourself.” You can’t have just one; you need to have both. And the link that unites them is God’s limitless generosity, acknowledged and enacted. When we gather as church each Sunday, we should ponder the stories that declare scarcity to be false: an impromptu hillside meal with as much in left-overs as when it began, a barren desert blossoming with manna, an earth fully equipped to meet everyone’s needs. And a question should be burning in our hearts: “What if it is true? What if one of the links between the Creator’s generosity and the neighbor’s needs is us, this community?” If that is not true, then scarcity rules and we are in sorry shape. But if it is, and if we believe it is, we can begin life anew as stewards of God’s abundance. Beautiful. I am challenged, among many other things, to reclaim Sabbath – not as a legalistic requirement, but, as Brueggemann says, as a witness to testify to the world that there is enough! Posted on February 29, 2012, in Biblical Studies, Economics, Mission, New Testament, Old Testament and tagged Abundance, Enough is Enough, Jesus Feeding the Crowds, Mark 8, Sabbath, Scarcity, TEAR, TEAR Australia, Walter Brueggemann. Bookmark the permalink. 4 Comments. Amazing and transformative reading of the biblicaltexts.There is hope in the generosity of God.